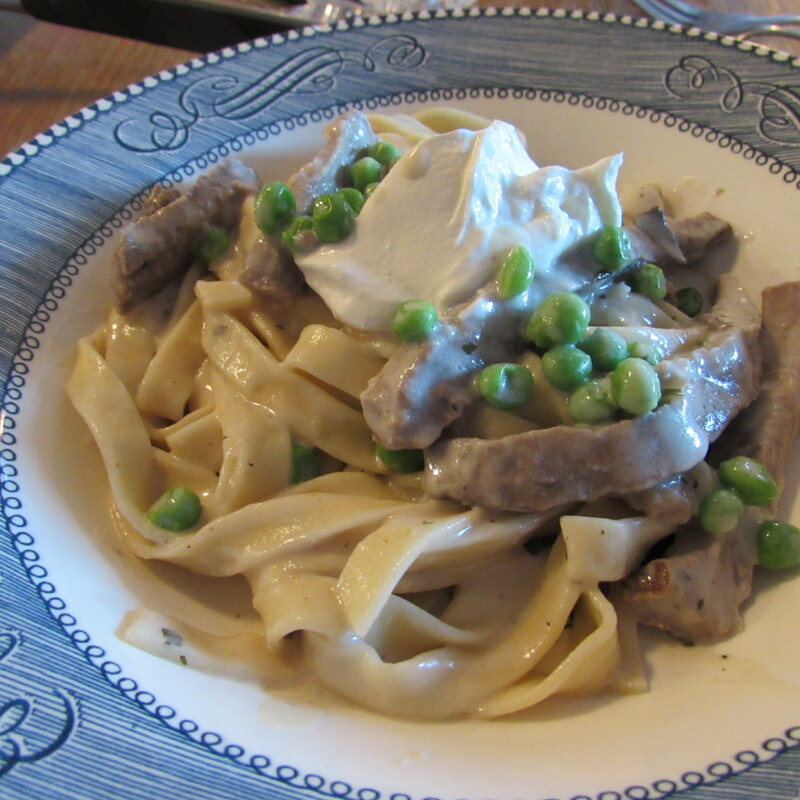 All the rave in the 70s and named after Count Pavel Aleksandrovich Stroganov, this is one of those great classic dishes where leftovers meet something fresh to make something amazing. Literally, this dish was made out of some leftover steak and tri tip, a handful of mushrooms from combo pizza pot sticker night, the last quarter of an onion buried deep in the crisper drawer of the fridge and a partial bag of frozen peas I inherited when our neighbor, Gretchen, moved away. 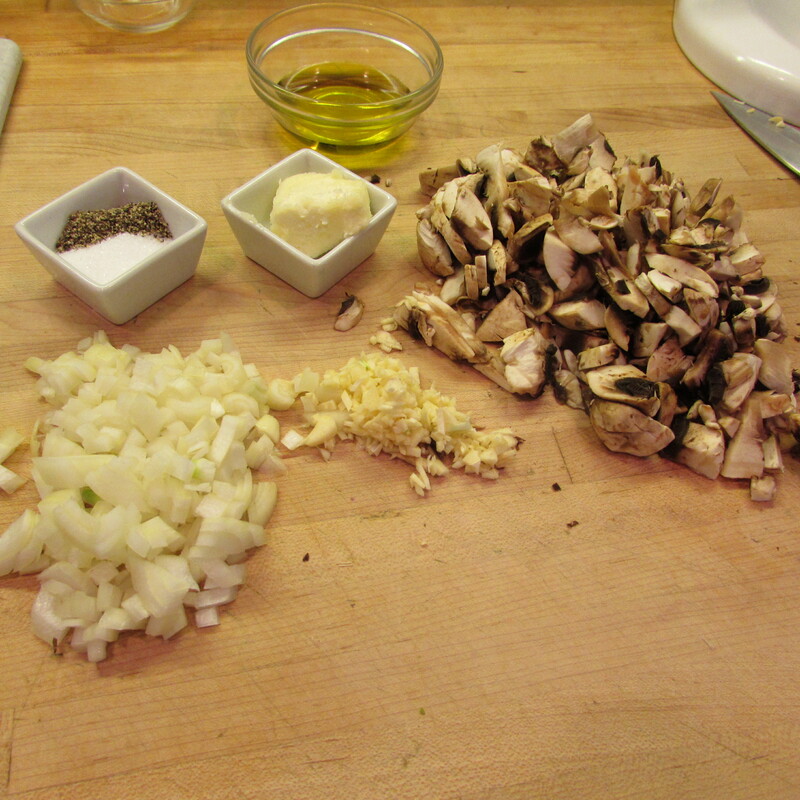 The pasta, of course, is from scratch. I normally make pasta in a stand mixer but mixing it with your hands works perfectly fine. Put a large pot of water on high heat while you make the pasta and Stroganoff. Mix together flour and salt. Put all four egg yolks in the flour and mix until well combined. Next mix in water until a stiff dough forms (you may have to do the last bit of mixing/kneading by hand as the dough forms). Let dough rest a few minutes while you get the stroganoff started, then, on a well-floured board, roll pasta as thinly as possible either by rolling pin or by pasta roller if you have one. Cut pasta to desired shape. 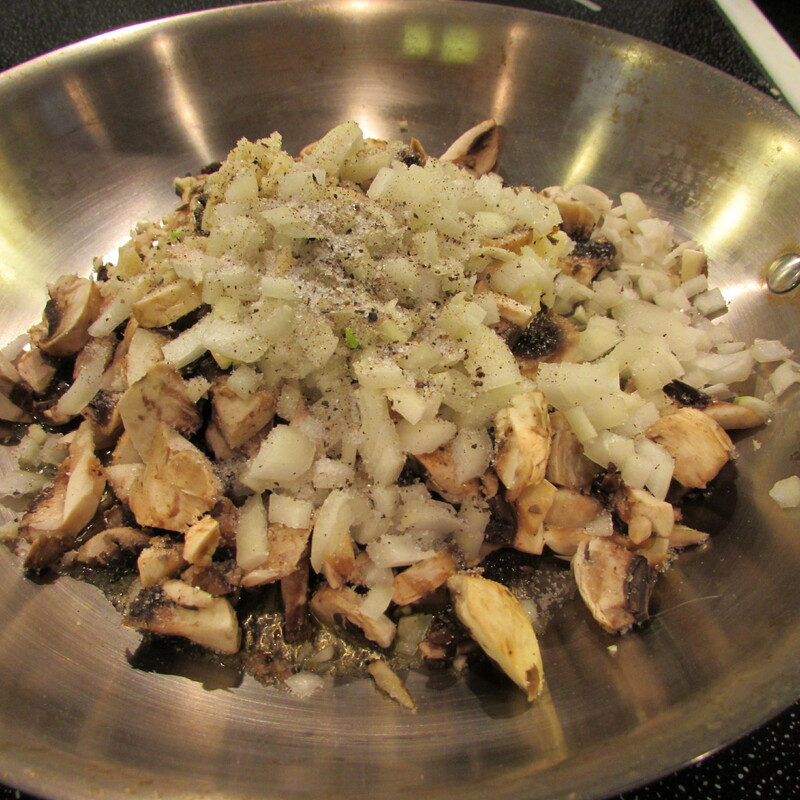 In a large skillet on medium heat, combine butter, olive oil, onion, garlic, mushroom, salt and pepper. Cook just until onions are translucent. 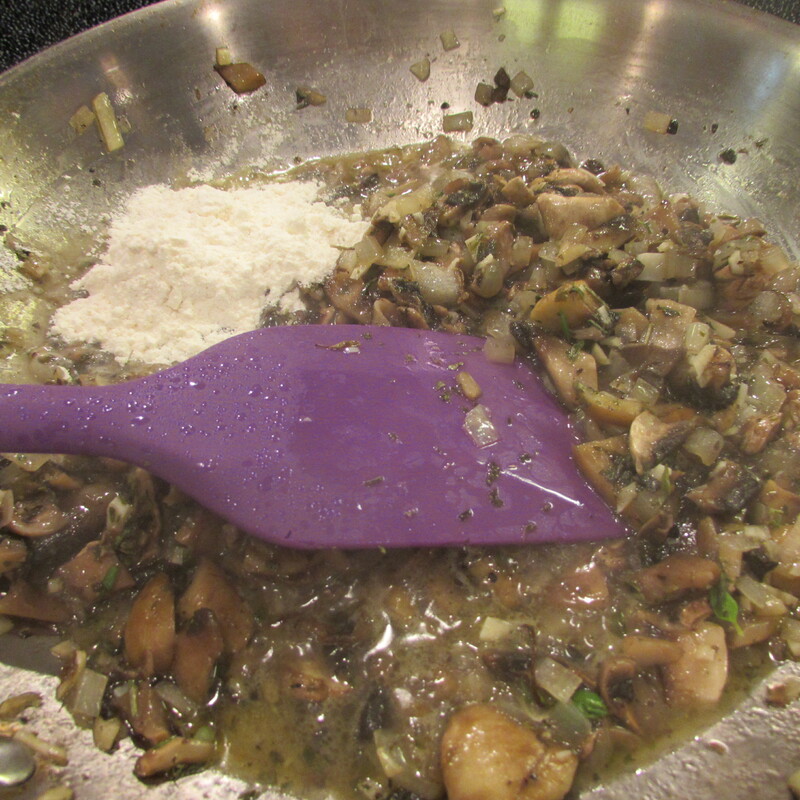 Stir in flour and continue cooking until flour turns brown. 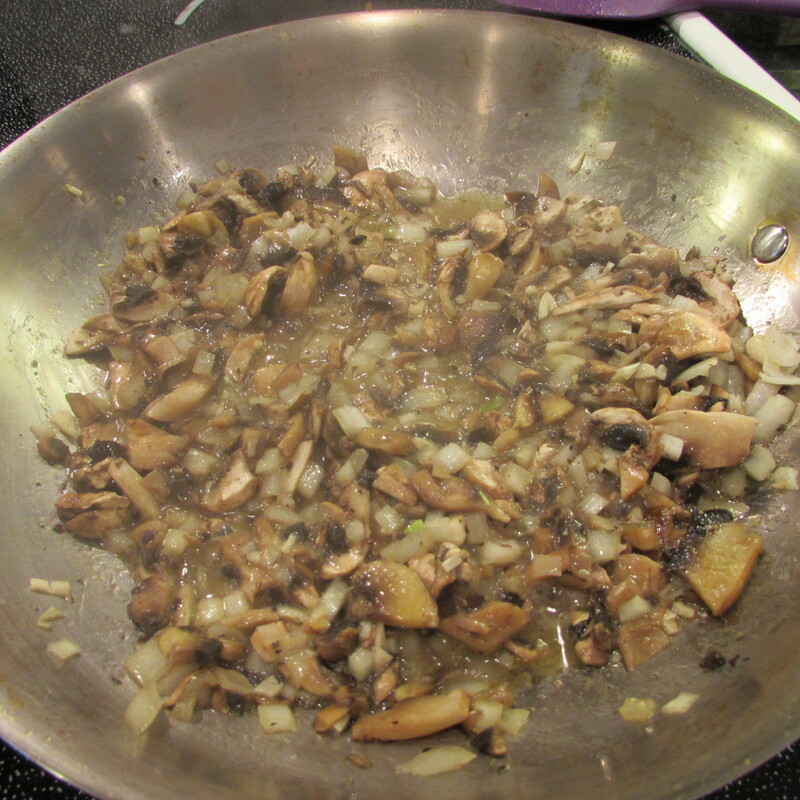 Add in wine and bring to a simmer. 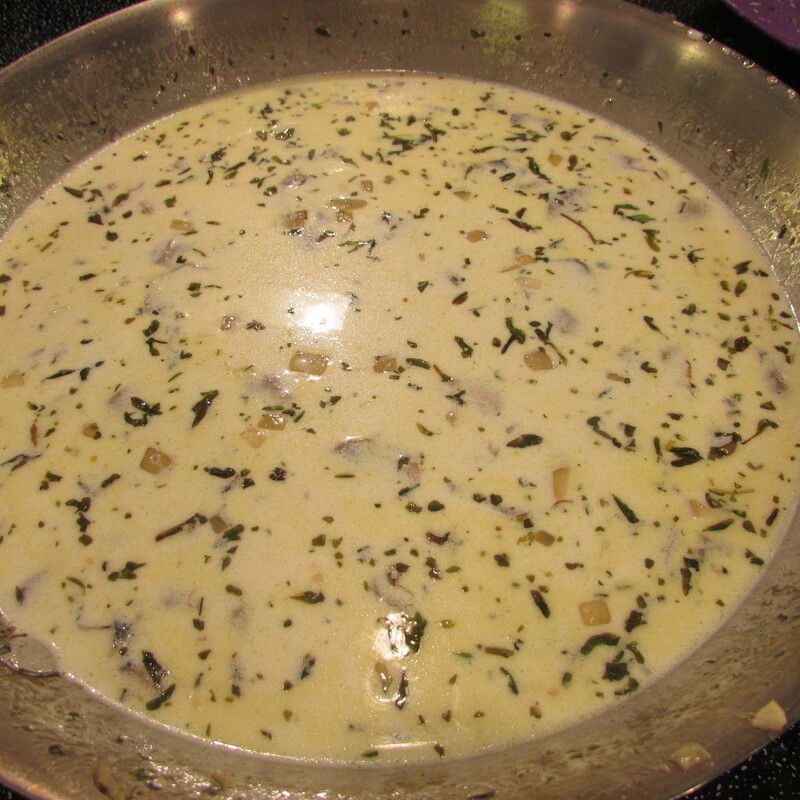 Stir in milk, cream, thyme and parsley and reduce heat to medium low. 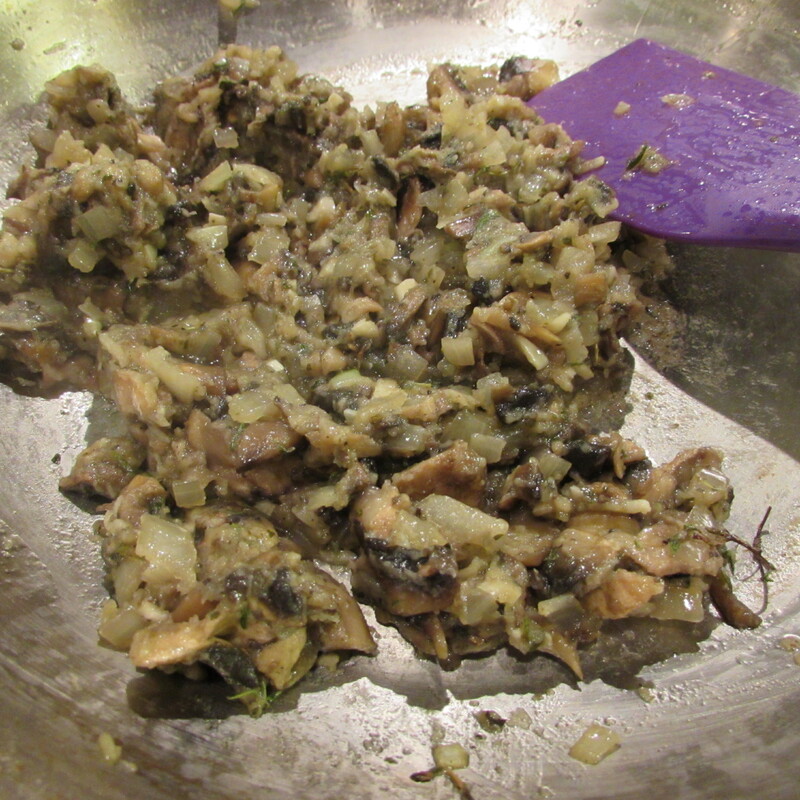 Cook until sauce starts to thicken, stirring frequently. 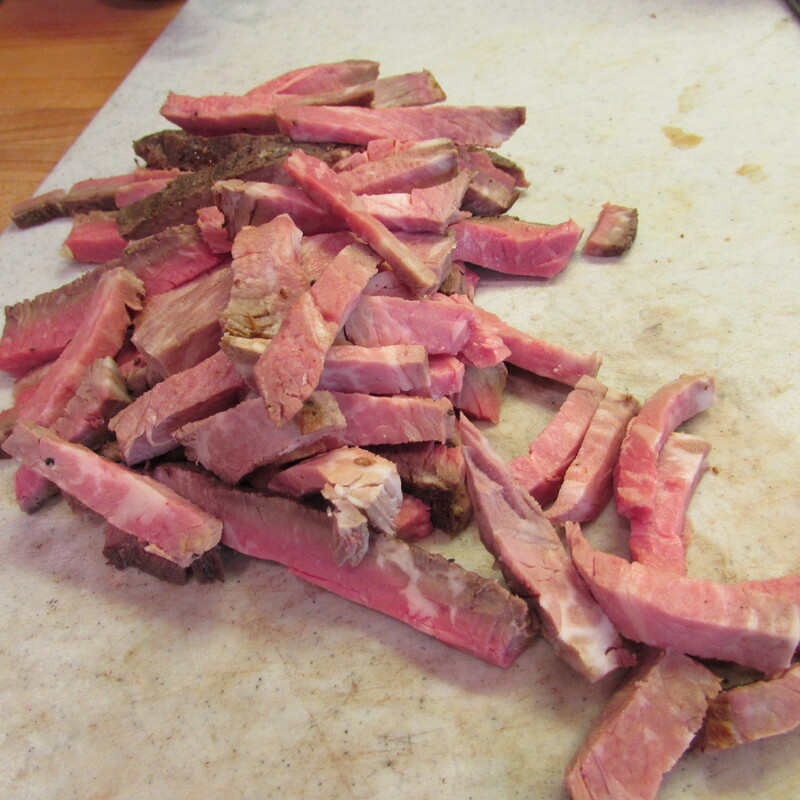 Once sauce is thickened, stir in beef. Don’t forget to taste for salt and pepper and correct as necessary. 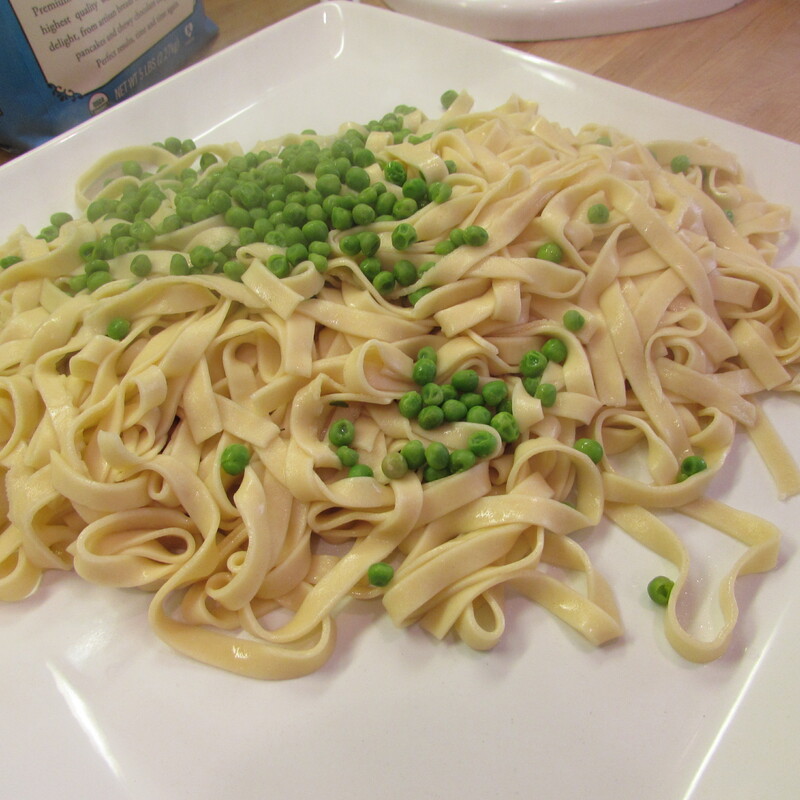 Once beef is hot, boil pasta and peas together. 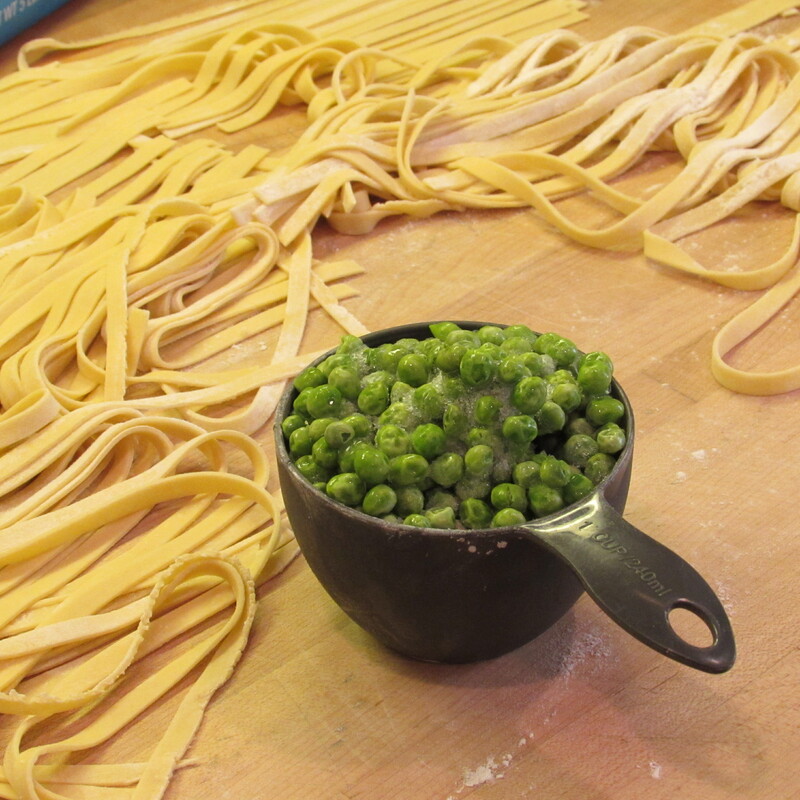 Note: Fresh pasta will cook in just a few minutes so if you are opting for packaged pasta, wait until the last few minutes of cooking time to add peas. Once pasta is tender and peas are hot, drain. 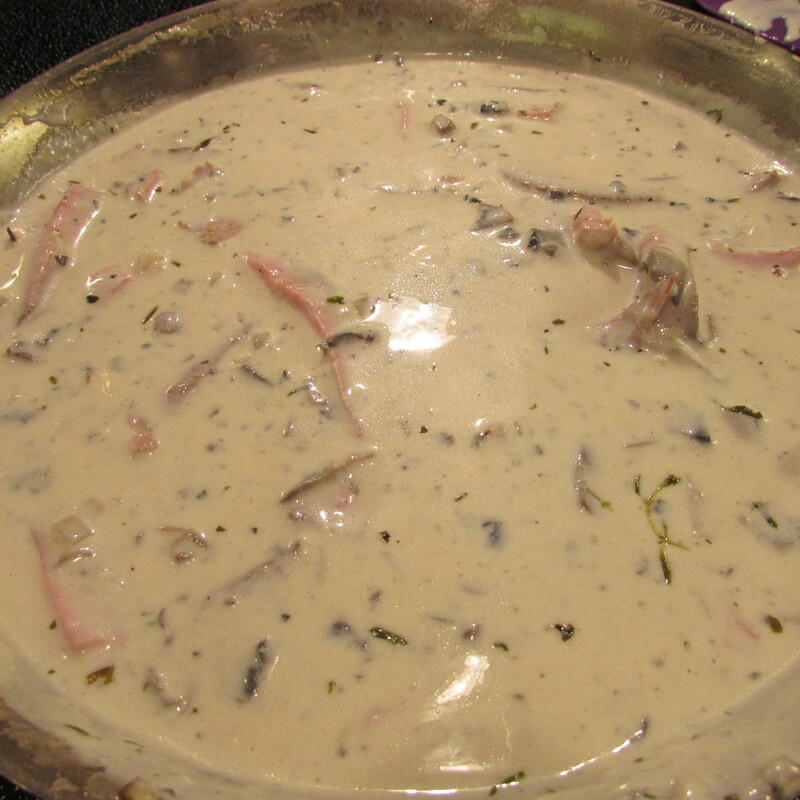 Place on a big plate (I like family style), top with stroganoff sauce and a dollop of sour cream. 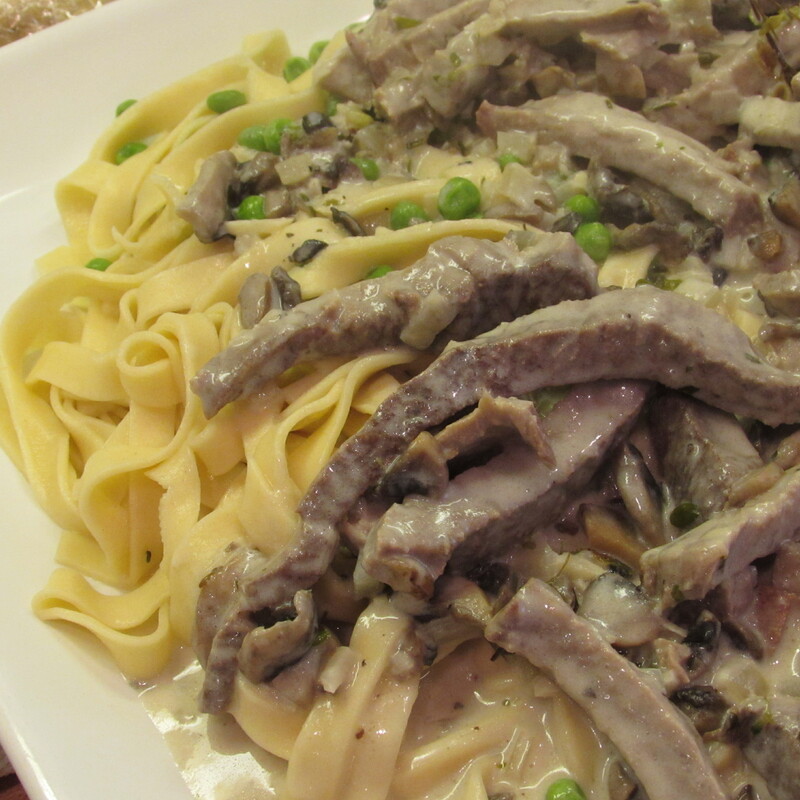 Tags: Beef stroganoff, beef stroganoff with mushrooms, beef stroganov, food, fresh pasta, leftover pasta dish, pasta from scratch, recipes, stroganoff history, Stroganov history, what to do with leftover steak, what to do with leftover tri tip, with images. Bookmark the permalink.